Earlier this month, I took a little road trip up I-95 to see the one-and-only Juanes perform at the Hard Rock Live at the at the Seminole Hard Rock Hotel and Casino. 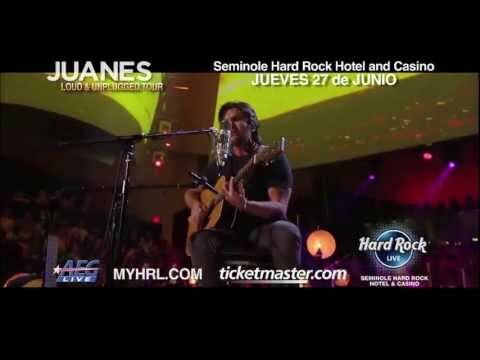 This was the first time I had seen Juanes perform since the taping of his Unplugged album in Miami, so I muy emocionada to hear him rock out at todo volumen! For those long-time Juanes fans, you will be interested to hear that he actually got a hair cut! His pelo has been a topic of conversation over the years…as he tends to let it grow out and then chop it short again in dramatic fashion. I personally like his hair on the long-side, as it reminds me of the Juanes I first met during the Mi Sangre Tour in 2006. What a great noche! This is the 2nd time I’ve seen a show at the Hard Rock Live and I’m really digging this venue! Check out their upcoming events to see if there are any artistas that interest you!